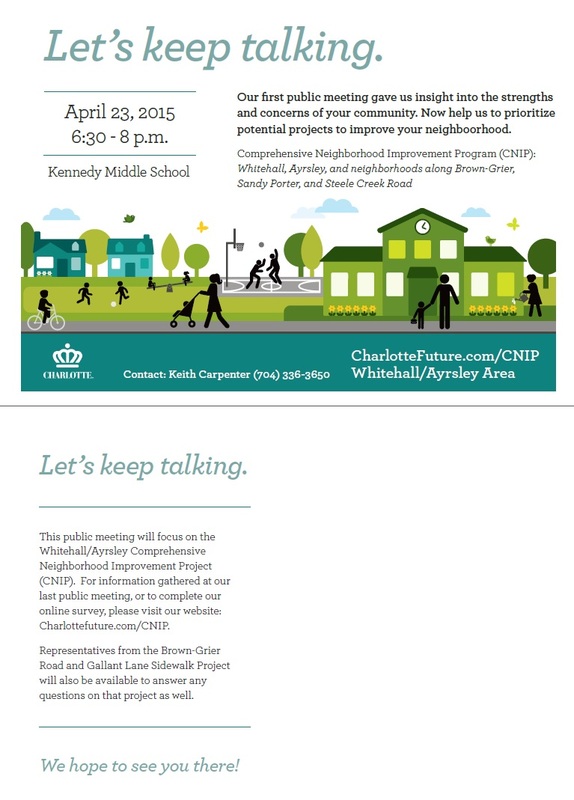 (April 14, 2015) Charlotte city staff and consultants will be holding the second public meeting on the Whitehall/Ayrsley Comprehensive Neighborhood Improvement Program (CNIP) on Thursday, April 23 from 6:30 to 8:00 PM at Kennedy Middle School. Charlotte has identified five neighborhoods across the city where it plans to make strategic investments to address a broad array of community needs. One of these is designated "Whitehall/Ayrsley." 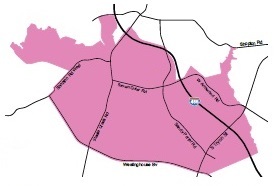 It covers areas of northern Steele Creek located between I-485 and Westinghouse Boulevard. In addition to Whitehall and Ayrsley, it includes parts of Berewick and neighborhoods along Brown-Grier Road, Sandy Porter Road, and Steele Creek Road. At the first neighborhood meeting in March, residents marked up maps with notes and stickers to identify areas where improvements to roads, intersections, sidewalks, trails, parks, and other infrastructure are needed. See Annotated Maps from the Whitehall/Ayrsley Community Meeting. This second community meeting will focus on specific projects, why those projects were selected, and how the projects should be prioritized in terms of importance to the community. Information also will be available about plans for new sidewalks along Brown-Grier Road and Gallant Lane leading to Kennedy Middle School.